Safeway became the latest company to say it will stop using sow gestation stalls in its food supply chain. NEW YORK (CNNMoney) -- Safeway is the latest corporate giant to publicly shun the use of tiny cages that immobilize pregnant sows which have been condemned by animal rights activists. 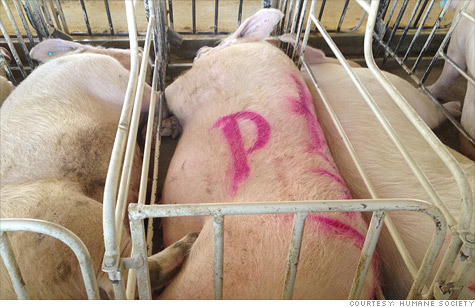 The grocery giant joins some of the largest companies in the country with its vow to phase out the use of these cages, called sow gestation stalls, to keep pigs confined. "Gestation stalls have been criticized in recent years due to animal welfare concerns," Safeway (SWY, Fortune 500) said in a statement announcing its plans "to have a gestation stall-free supply chain." The Humane Society, which has compared these cages to the Medieval torture devices known as "iron maidens," trumpeted Safeway's decision as the latest victory in the struggle for animal rights. Fast food franchises McDonald's, Wendy's and Burger King as well as the foodservice giant Compass Group have all begun to phase out pork suppliers that use the stalls. McDonald's (MCD, Fortune 500) announced in February that it "wants to see the end of sow confinement in gestation stalls in our supply chain." Wendy's (WEN) says it has been giving preferential treatment to suppliers who don't use the stalls since 2007, and that it wants "to eliminate the use of sow gestation stalls over time." Burger King also said it's been transitioning towards a supply chain free of sow gestation stalls since 2007. But not everyone in the $4 billion pork industry is against the stalls. Some say they prevent surly sows from hurting each other and make it safer for farmers to feed them and provide medical care. Dave Warner, spokesman for the National Pork Producers Council, said that moving sows out of gestation stalls will increase pig fatalities and hurt production, and that increased costs will be passed along to consumers. Nonetheless, pork producers have been bowing to market pressure to make the switch, though they're doing it very gradually. Warner said that retrofitting the barns to group pens instead of gestation stalls is expensive. He cited a study by the University of Minnesota that estimates it will cost the industry $1.9 billion to $3.2 billion to make the switch. Phasing out the stalls over a longer period of time could help reduce costs, as farmers would eventually have to retrofit or replace aging barns anyway, he said. Smithfield Foods (SFD, Fortune 500) said it's converted 30% of its farms away from gestation stalls, and plans to be 100% free of them by the end of 2017. Hormel Foods (HRL, Fortune 500) says it has transitioned 75% of its sows in Arizona and Colorado "to group sow housing," and is planning to start transitioning its Wyoming pig farms before 2018. Cargill spokesman Mike Martin said his company produces 30% of the pork it sells, and half of that is grown without gestation stalls. Martin says the movement away from the small cages is "driven by our customers." But, he adds, "there is no evidence that gestation stalls cause any problem for the animals." The trend is part of growing consumer awareness about animal rights, which extends well beyond pigs. Burger King and Wendy's are transitioning to cage-free chickens as a source for their eggs. Starbucks (SBUX, Fortune 500) recently said it would phase out the use of crushed bug extract for the red dye in some of its drinks.